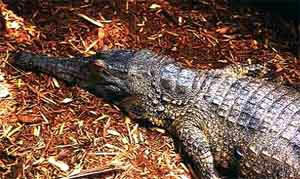 The African slender-snouted crocodile is a medium-sized freshwater crocodile found in Central and western Africa. One of the least known of the world's crocodiles, this species according to recent studies, may possibly be the only species in its genus (Mecistops), but presently, most biologists still consider it as apart of the Crocodylus genus. Adults grow to about 9.84 to 13.1 feet long. As its name suggests, this species possesses a long, slender snout used for catching fish and other prey. The skin of adults is leathery and brownish-yellow in color with large black spots. The head is olive-colored with black blotches and markings. There are about six rows of tough scales that run down the back. This species is found in rivers, marshes, lakes, and pools of the equatorial rainforest where it prefers large, swift-flowing streams. It is a very shy species and also a remarkably agile swimmer. It is often found resting in the shade of trees and prefers to remain in groups except during the onset of the breeding season. Diet consists of fish, frogs, snakes, shrimps, crabs, and also waterbirds and mammals. Mating occurs in February, and in March, females build nests by scraping vegetation together with their hindfeet. Large nesting mounds of over 3.5 feet long and 6.6 feet wide have been observed. Females lay between 12 and 30 eggs, and the eggs hatch after 90 to 100 days of incubation. 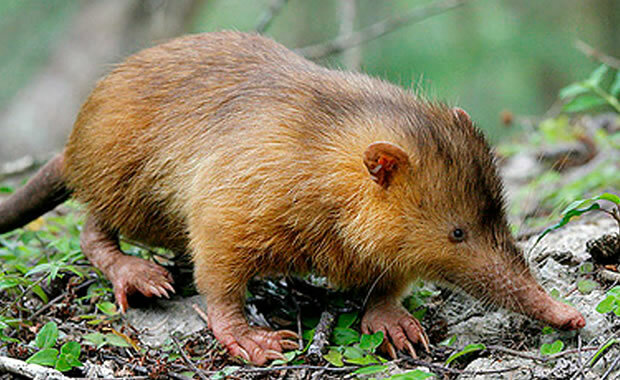 It is difficult to determine the conservation status of this species due to the limited biological information available. But surveys suggests significant population reduction possibly due to hunting for its hide and for food. Some crocodiles are accidently caught and drowned in fishing nets. This species is legally protected throughout much of its range, although this is poorly enforced. Copyright Notice: This article is licensed under the GNU Free Documentation License. It uses material from the Wikipedia article "Slender-snouted crocodile". Glenn, C. R. 2006. "Earth's Endangered Creatures - African Slender-snouted Crocodile Facts" (Online). Accessed 4/23/2019 at http://earthsendangered.com/profile.asp?sp=87&ID=1. Need more African Slender-snouted Crocodile facts?